If I started listing all the people Daru Jones has played with in the last 20 years we'd be here until the internet freezes over. It's a big list drawn from the worlds of pop gigs, arena shows with Jack White, DJ duos, EDM, country, jazz, and R&B. Despite his versatility, though Jones is first and foremost a hip-hop drummer with an R&B-inflected style he calls "soulhop." With his encyclopedic knowledge of hip-hop nuance that starts with Dre and Dilla and rolls up to the present day, and an equally insightful understanding of his heroes such as Gadd, Hakim, and Colaiuta, he is frequently called on bring his special contemporary magic to projects in the roles of drummer, musical director, or producer. At the NAMM Show this past January, Jones mentioned some new music coming out from a side project called DMD. It features Jones with legendary bassist Doug Wimbish of Living Colour and a hot young guitarist named Marcus Machado-"the Jimi Hendrix of hip-hop" in Jones' words. Immediately intrigued, I dragged him to a quiet corner next to a stairwell to interview him about how he gets hired, how new projects come about, and juggling a life wearing multiple musical hats. DRUM! : This project with Wimbish has been a long time coming. How did it come about? Daru Jones: It really got started in 2013 when Mono Cases-which is now Mono Creative-had this idea of bringing different artists together, and they asked me to meet with [bassist] Doug Wimbish. That was a real honor for me. We connected and wanted to get back together. Then 2014 Uncle Dougie-we call him that because he is OG-invites me to play at his Wimbash event. At the time I was on tour with Jack White so I took a train to Connecticut where Doug lives. I was so tired I slept through my stop but I finally got there a day before the Wimbash. Doug says, "Let's get in the studio and record." We just jammed for about three hours and Doug made a CD of that for me, just two tracks. Later I chopped it up and made ten tracks of what we recorded. That was the start. At what point did you and Doug add Marcus Machado to the project? How did it develop? One day Marcus was talking to my friend DJ Spinna and told him that it was a goal for him to play with me. DJ Spinna says "I know Daru," so he called me. I talked to Marcus for a second and he sent me a couple of tracks. I listened and thought, This is amazing, the Jimi Hendrix of hip-hop. I asked Marcus to see what he could add to the tracks. He laid down guitar on it and blew me away. He turned the jams into songs, adding melodies. We were supposed to release the music two years ago at the time I was on the Seth Meyers show [Late Night With Seth Meyers]. I had put out the single "After Dark" in 2017, on my independent label, Rusic. But I felt we needed a bigger label. Then Doug Wimbish started a new project with Living Colour. After that we thought it might be great to add vocals. So we got some great people like Van Hunt, and Bobby Sparks-the organist who is now with Snarky Puppy. That has turned it into a whole new project. Last year Sweetwater brought us in to be in a class at their festival and we recorded the songs as long jams. So now I'm cutting them up as a sampler of the real music that will finally come out later this year. When you're home are you hustling gigs, are you on the phone looking for work? Or are the gigs finding you? All the above. I am thankful that so many of them come to me. I know that they can pick and choose and also there's a lot of politics in the business. A lot of it is referrals. You get one job and that leads to another. I'm working with Pete Rock. Pete was really the first to start sampling jazz back in the golden era of hip-hop. At the time he was having a problem clearing samples, so I hired a band to re-record the original music as close as possible so those could be the samples. This was for the Don't Smoke Rock band. Later, Pete was hired to produce the Winter Jazz Festival and I was the music director for his band. That led to playing the Blue Note and Summer Stage. I play with [beatbox singer] Jamie Liddell. I got recommended to him through [bassist] Pino Palladino [The Who, D'Angelo, John Mayer]. I went into the studio and cut 12 tracks with Jamie so when the album was done he said he wanted to tour with that band and asked me to be the MD of the band. With him we've toured Europe, North Sea Jazz. We did a month with a seven-piece band, which I loved. You don't always get the chance to go out with a full band these days. "When you record there are a thousand things you can play on a song but only one or two that will work"
Because of reputation you get these calls. What do you turn down? If I turn it down it's usually due to style. As a kid I knew I wanted to be able to move around different genres like the people I admired, like Steve Gadd. I am down to work with new artists but I have to like the music. If you're going to seriously work with the artist, and they are going to name you or the other musicians on the record as part of their marketing, then I want some points. You realize what your worth is. I just started recognizing this. If they hire me to create, then I'm not going to just play the drum machine track, I'm going to create. You've played some big tours in the pop world with Jack White and others. What does it take to get you to go on the road? Where I'm at now I'm usually only touring if I played on the record. They work together. Because you contribute your sound and play on the album and by touring it's going to the greater good of creating music, getting to play bigger places, more people hear it, possibly win awards, all of that. What about when it's virtual, when people send you tracks? Basically in four years of Nashville, the first couple of years I had some country dates but now a lot of work is coming from out of town. I record at Layman Drug Company, this great studio that used to be a pharmacy. I go there to record tracks. It doesn't take me long to put a track together for a recording. I like those sessions because then they are not telling me what to play, they are saying do what you do. I don't even want to hear the tracks beforehand. I want to hear it in the studio and challenge the music. Sometimes I have another beat or track in mind to inspire me and make my version of it. What about the situation where you are the producer or the music director? When you're wearing those hats what changes? Intro, verse, bridge. It's a format. Becoming a producer changed my playing. When you record there are a thousand things you can play on a song but only one or two that will work. When I'm a producer I'm listening. The people in the audience are not technical about the music. They want to hear the clap and the 2 and 4. If you listen a to a classic record you might hear a simple fill or a simple beat and say "I can do that." But would you have played that? 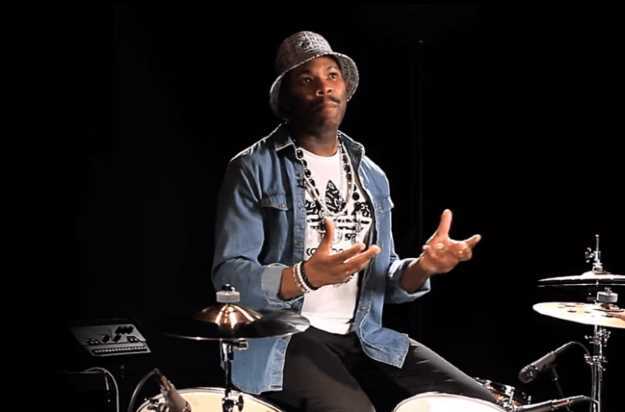 How did you become a go-to hip-hop drummer? In the 2000s a lot of hip-hop artists wanted to play Europe. But in order to do that they needed a live band. So I became the drummer for Slum Village and a lot of those guys. I was playing the things I had learned when I was young listening to J Dilla and all those producers. I always try to keep it basic, too. I learned that from that Peter Erskine video. Him, Omar Hakim-those guys are part of my DNA too. And Questlove and The Roots. After them, hip-hop did not have to be only electronic. With a band you can extend the songs, you can improvise more. It takes it to another level, when you are playing with that DJ and not just to the DJ. "I like those sessions because they are not telling me what to play, they are saying do what you do I dont't even want to hear the tracks beforehand"
Can the DJs really cut the gig? To play with a band the DJ has to become more of a musician and play his part. There's only a handful of DJs who know how to do that really well. They can't scratch the whole song, they have to look for new sounds, and atmosphere that really works. Did you ever have to pass a great gig because you were already busy? There were opportunities that came that I had to pass on. D'Angelo started trying different drummers out after Questlove got Tonight Show. He used John Blackwell for a while, and then Pino recommended me. I had a ticket to go rehearse with them but they also knew I would be going out with Jack White, so that fell through. The timing wasn't right. Those things happen. But just be cool. Only one person can hold down one gig. Two people can't. Being loyal to Jack was good because that was a great gig and he let me shine as a drummer, gain a new fanbase. He opened doors for me. I even have a signature kit. People remember loyalty. For the Record: Daru plays his signature DW kit, as well as DW pedals and hardware, Paiste cymbals, Promark sticks, Monocase cases, and Evans heads. He's also got two libraries of loops and samples, available through sounds.com.